I've been so good these last few weeks restraining myself by not blogging more than five new posts a day, but this sudden, spur of the moment event desperately called for something to be posted… in this case quite literally! Sometimes I have to remind people I'm hilarious otherwise they'd forget you see. 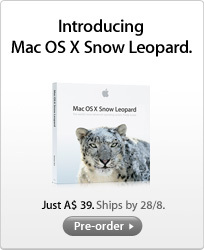 Shortly after it went live here in Australia I placed a pre-order for Snow Leopard! According to them it'll be shipped on the 28th. Thank you for shopping at the Apple Store. We’re processing your order now. Please visit Order Status to review, maintain, and track your order at any time. If you have questions about Payment Details, What Happens Next, or Shipping and Delivery Details, please visit Customer Service. We will let you know by email when your order ships. 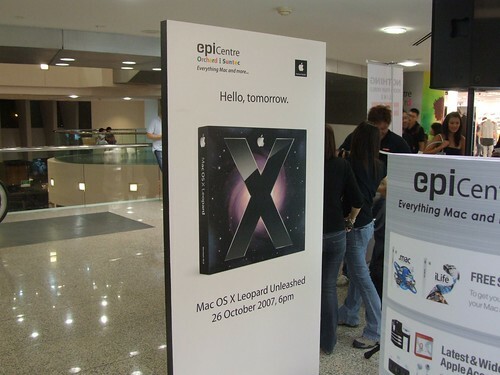 And to think it only seemed like yesterday when I was in Singapore for the launch of Leopard and uploaded some photos. Can't believe that was in 2007, time flies huh?